Dutch Cycling Embassy - Quattrocycle B.V. The Quattrocycle is the ultimate LEV (Life Enhancing Vehicle). The perfect short distance family bike for fun, health and the environment. It is powered by you and an optional electric boost. Perhaps you've already seen the Quattrocycle on the road and said, "What is that?" Yes, this is that cool bike™! Quattrocycle pioneers across Europe, the USA and Canada are already living the good life. The Quattrocycle is like a bicycle car where everyone can pedal. In fact, you each get your own gear shift! You are free to pick your own perfect cadence. Each seat is also individually height adjustible for the rider's leg length. This allows every rider to not only participate but to adjust the performance of the outing as they see fit. Want to relax? you can just coast. Want a fast cadence? lower your gear range. Want to go fast down those hills? up your gearing. These quad-cycles with four wheels allow you to have a conversation just as you do in your automobile. With electric assistance you'll climb hills with ease. The Quattrocycle is also very suitable for fun use and leisure travel for the physically disabled. We can adapt the Quattrocycle for the healthcare sector. You can take your clients for a safe and comfortable ride! We can install foot supports and safety belts, so you don't have to worry about people falling off or a pedaling misstep. Of course, your clients are not obliged to pedal along. 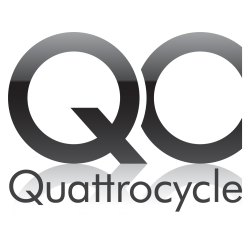 The Quattrocycle company is founded by Toin Verhoeven and Korné Welmers in 2008.